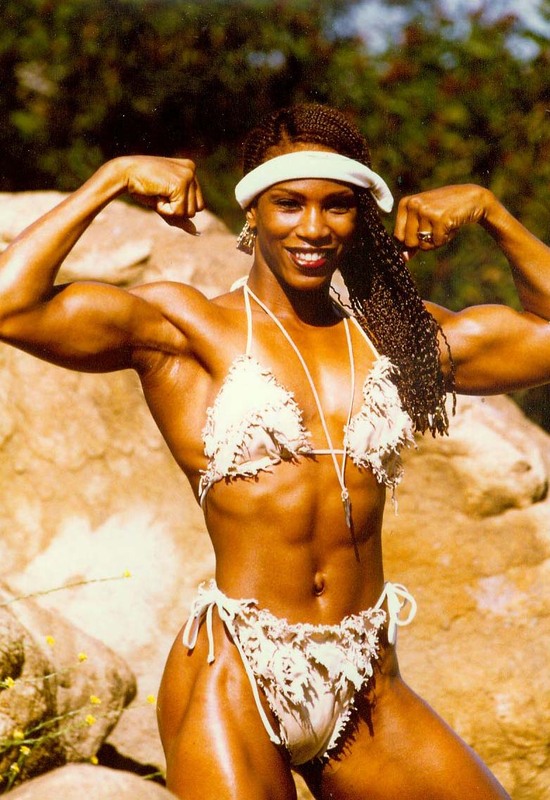 Shari (sometimes spelled Sha-ri) competed in one bodybuilding contest in the 1990s, but she was far better known for being an Olympic sprinter, then as a Gladiator. She was featured in a national magazine in the late 90's, showing off her impressive physique (arms, back and thighs stand out), and we received some fanmail asking if we could do a video with her. WPW freelance videographer, Tony Duffy, photographed the Olympic track events for Sports Illustrated and befriended Shari early on. Bottom line- Tony shot camcorder footage of Shari each year from the mid-80's to late 90's, though the material was never intended for commercial release. Shari OK'd releasing that, and in 1999 Tony used his pro video equipment to tape new material of her posing and working out heavy in the gym (bench pressing 225 and squatting 315 for reps, etc). Some of the earliest camcorder segments are not the best quality, but that improved quickly and scenes include sprinting at the track, bodybuilding-style posing and her stage routine at her contest is included.